How does the bite-size P43 chipset stand up? Clocking in at over £100 less than MSI's P45 board, Gigabyte's P43 option is an attractive choice for people who want P45-esque performance on a budget. As the name suggests, it's an ever so slightly inferior revision to the P45 chipset – Gigabyte's board features a single 16x PCI-express slot (so no CrossFire for you), will only support up to 1,200MHz DDR2 RAM, and doesn't feature the high-end sound card you get with the likes of MSI's P45 Diamond. There's also no Firewire port, which may vex some people. But, obviously, these are all cost-cutting measures, and the fact that you're getting a stripped-down version of the P45 chipset for under £75 is not to be sniffed at. lags behind the more expensive offerings from MSI and Asus in their P45 garbs but therein lies the rub. The memory speed is the key factor in this, and you're purchasing choice will depend on whether or not you'd rather spend an extra £100 or so on a few extra PCMarks. As with most motherboards these days, the P43 includes a power-saving mode; in terms of Gigabyte it's the Dynamic Energy Saver system. When in 'Stealth Mode' the system dynamically throttles back the power draw in relation to what's being used PC-wise. The software interface is one of the better we've seen, and the amount of power being used by the CPU is indicated with LEDs on the motherboard – overclocking gives you more red lights. It may sound gimmicky on paper, but being able to easily see whether your BIOS tweaking is actually functioning is a great feature. – with overclocking. It's an impressive ﬁgure for such a cheap motherboard, although you will have to get your hands dirty in the BIOS to enter the upper echelons of overclocking. Google is your friend when it comes to tweaking this particular mobo – there's a wealth of information available online, the most significant of which suggests that while there are few problems experienced with Windows XP, it's a whole different kettle of worms with Vista. Making sure that you've upgraded from the supplied BIOS F2 to BIOS F7 gives you a ﬁghting chance with Microsoft's latest resource-hungry OS. Another advantage of the Gigabyte board is that it features not one, but two BIOS chips – very useful indeed for backup in case you get trigger-happy with your clock speeds. 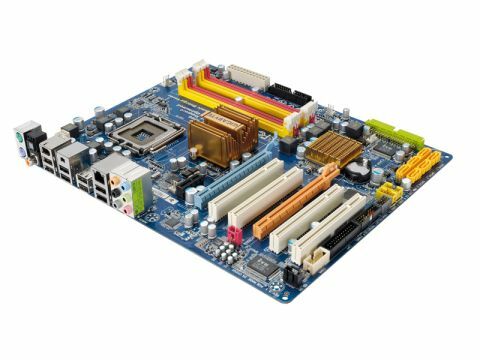 The only slight problem with Gigabyte's entry is the price – it's only £10 less than MSI and Asus' entry-level P45 boards. But it is fully-featured and still represents great value.